Late last year, I took a road trip with my partner from our home in New Orleans, Louisiana to Orlando, Florida and as we drove by town after town, we got to talking about the potential effects self-driving vehicle technology would have not only on truckers themselves, but on all the local economies dependent on trucker salaries. Once one starts wondering about this kind of one-two punch to America's gut, one sees the prospects aren't pretty. It should be clear at a glance just how dependent the American economy is on truck drivers. According to the American Trucker Association, there are 3.5 million professional truck drivers in the US, and an additional 5.2 million people employed within the truck-driving industry who don't drive the trucks. That's 8.7 million trucking-related jobs. We can't stop there though, because the incomes received by these 8.2 million people create the jobs of others. Those 3.5 million truck drivers driving all over the country stop regularly to eat, drink, rest, and sleep. Entire businesses have been built around serving their wants and needs. Think restaurants and motels as just two examples. So now we're talking about millions more whose employment depends on the employment of truck drivers. But we still can't even stop there. Those working in these restaurants and motels along truck-driving routes are also consumers within their own local economies. Think about what a server spends her paycheck and tips on in her own community, and what a motel maid spends from her earnings into the same community. That spending creates other paychecks in turn. So now we're not only talking about millions more who depend on those who depend on truck drivers, but we're also talking about entire small town communities full of people who depend on all of the above in more rural areas. With any amount of reduced consumer spending, these local economies will shrink. 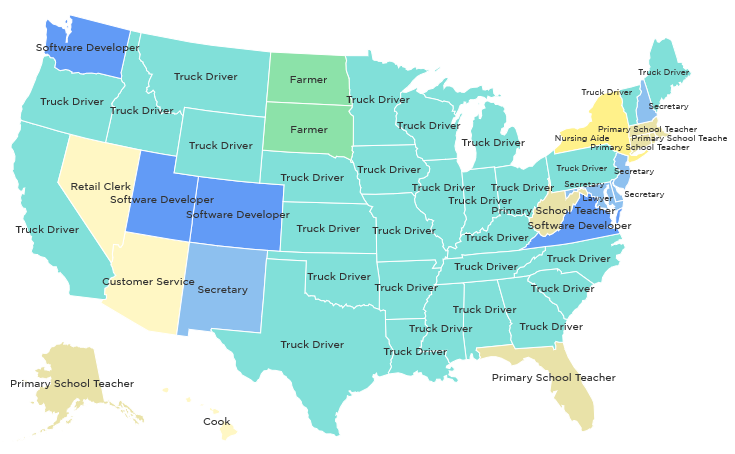 One further important detail to consider is that truck drivers are well-paid. They provide a middle class income of about $40,000 per year. That's a higher income than just about half (46 percent) of all tax filers, including those of married households. They are also greatly comprised by those without college educations. Truck driving is just about the last job in the country to provide a solid middle class salary without requiring a post-secondary degree. Truckers are essentially the last remnant of an increasingly impoverished population once gainfully employed in manufacturing before those middle income jobs were mostly all shipped overseas. If we now step back and look at the big national picture, we are potentially looking at well over 10 million American workers and their families whose incomes depend entirely or at least partially on the incomes of truck drivers, all of whom markedly comprise what is left of the American middle class. So as long as the outlook for U.S. trucking is rosy, we're fine, right? The trucking industry expects to see 21 percent more truck driving jobs by 2020. They also expect to see an increasing shortfall in drivers, with over 100,000 jobs open and unable to find drivers to fill them. Higher demand than supply of truckers also points to higher pay, so for at least the next five years, the future is looking great for truck drivers. The only thing that could put a damper on this would be if the demand for truck drivers were to say... drive off a sharp cliff. That cliff is the self-driving truck. The technology already exists to enable trucks to drive themselves. Google shocked the world when it announced its self-driving car it had already driven over 100,000 miles without accident. These cars have since driven over 1.7 million miles and have only been involved in 11 accidents, all caused by humans and not the computers. And this is mostly within metropolitan areas. "And as you might expect, we see more accidents per mile driven on city streets than on freeways; we were hit 8 times in many fewer miles of city driving." So according to Google's experience, the greater danger lies within cities and not freeways, and driving between cities involves even fewer technological barriers than within them. Therefore, it's probably pretty safe to say driverless freeway travel is even closer to our future horizon of driverless transportation. How much closer? It has already happened. On May 6, 2015, the first self-driving truck hit the American road in the state of Nevada. Self-driving trucks are no longer the future. They are the present. They're here. "AU 010." License plates are rarely an object of attention, but this one's special -- the funky number is the giveaway. That's why Daimler bigwig Wolfgang Bernhard and Nevada governor Brian Sandoval are sharing a stage, mugging for the phalanx of cameras, together holding the metal rectangle that will, in just a minute, be slapped onto the world's first officially recognized self-driving truck. According to Daimler, these trucks will be in a decade-long testing phase, racking up over a million miles before being deemed fit for adoption, but the technology isn't even anything all that new. There's no laser-radar or LIDAR like in Google's self-driving car. It's just ordinary radar and cameras. The hardware itself is already yesterday's news. They're just the first ones to throw them into a truck and allow truckers to sit back and enjoy the ride, while the truck itself does all the driving. If the truck needs help, it'll alert the driver. If the driver doesn't respond, it'll slowly pull over and wait for further instructions. This is nothing fancy. This is not a truck version of KITT from Knight Rider. This is just an example of a company and a state government getting out of the way of technology and letting it do what it was built to do -- enable us to do more with less. In the case of self-driving trucks, one big improvement in particular is fewer accidents. In 2012 in the U.S., 330,000 large trucks were involved in crashes that killed nearly 4,000 people, most of them in passenger cars. About 90 percent of those were caused by driver error. That's like one and a half 9/11s yearly. Robot trucks will kill far fewer people, if any, because machines don't get tired. Machines don't get distracted. Machines don't look at phones instead of the road. Machines don't drink alcohol or do any kind of drugs or involve any number of things that somehow contribute to the total number of accidents every year involving trucks. For this same reasoning, pilots too are bound to be removed from airplanes. Humans are dangerous behind the wheel of anything. Robot trucks also don't need salaries -- salaries that stand to go up because fewer and fewer people want to be truckers. A company can buy a fleet of self-driving trucks and never pay another human salary for driving. The only costs will be upkeep of the machinery. No more need for health insurance either. Self-driving trucks will also never need to stop to rest, for any reason. Routes will take less time to complete. All of this means the replacement of truckers is inevitable. It is not a matter of "if", it's only a matter of "when." So the question then becomes, how long until millions of truckers are freshly unemployed and what happens to them and all the rest of us as a result? 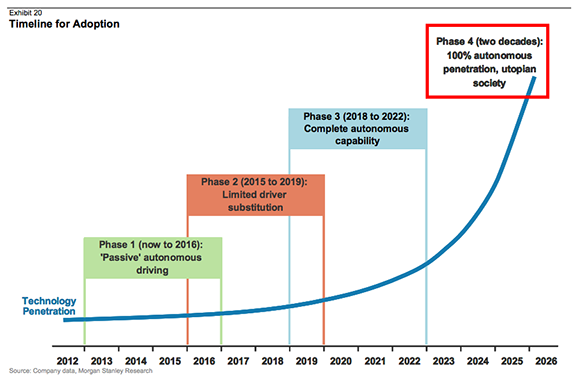 First, let's look at the potential time horizons for self-driving cars. Tesla intends to release a software update next month that will turn on "autopilot" mode, immediately allowing all Tesla Model S drivers to be driven between "San Francisco and Seattle without the driver doing anything", in Elon Musk's own words. The cars actually already have the technology to even drive from "parking lot to parking lot", but that ability will remain unactivated by software. Tesla-driven humans won't be able to legally let their cars do all the driving, but who are we kidding? There will be Teslas driving themselves, saving lives in the process, and governments will need to catch up to make that driving legal. This process is already here in 2015. So when will the process end? When will self-driving cars conquer our roads? According to Morgan Stanley, complete autonomous capability will be here by 2022, followed by massive market penetration by 2026 and the cars we know and love today then entirely extinct in another 20 years thereafter. Navigant Research: "By 2035, sales of autonomous vehicles will reach 95.4 million annually, representing 75% of all light-duty vehicle sales." IHS Automotive: "There should be nearly 54 million self-driving cars in use globally by 2035." ABI Research: "Half of new vehicles shipping in North America to have driverless, robotic capabilities by 2032." Nissan: "In 2020 we're talking more autonomous drive capability. It's going to be an evolutionary process and 2020 will be the first year to truly see some of these capabilities start to be introduced in the vehicle." Take all of these estimates together, and we're looking at a window of massive disruption starting somewhere between 2020 and 2030. There is no turning the wheel in prevention of driving off this cliff either. Capitalism itself has the wheel now, and what the market wants, the market gets. Competition will make sure of it. Tesla and Google are not the only companies looking to develop autonomous vehicles. There are others. A company named Veeo Systems is developing vehicles as small as 2-seaters to as large as 70-seat buses, and will be testing them in 30 U.S. cities by the end of 2016. At 25 to 40 percent cheaper, the cost to ride the driverless public transit vehicles will be significantly less expensive than traditional buses and trains... The vehicles are electric, rechargeable and could cost as low as $1 to $3 to run per day. Apple is also developing its own self-driving car. And Uber is developing its own self-driving car. Uber said it will develop "key long-term technologies that advance Uber's mission of bringing safe, reliable transportation to everyone, everywhere," including driverless cars, vehicle safety and mapping services. It's this last one that fully intends to transform the transportation landscape. Uber is going all-in on self-driving vehicles to the point it wants to entirely eliminate car ownership as a 20th century relic. Travis Kalanick, the CEO and founder of Uber, said at a conference last year that he'd replace human Uber drivers with a fleet of self-driving cars in a second. "You're not just paying for the ca -- you're paying for the other dude in the car," he said. "When there's no other dude in the car, the cost of taking an Uber anywhere becomes cheaper than owning a vehicle." That, he said, will "bring the cost below the cost of ownership for everybody, and then car ownership goes away." That's the potential of self-driving cars -- the outright extinction of car ownership. And with that, the elimination of entire industries built up around the existence of car ownership like: mechanics, car washes, parking, valets, body shops, rental companies, car insurance, car loans, and on and on. Even hugely expensive and capital intensive mass-transit infrastructure projects like streetcars and light rail can be dropped in favor of vastly cheaper on demand robotic "transportation clouds", and all those construction and maintenance jobs right along with it. Big players are already in the game. There are huge savings to be found, huge profits to be created. Higher quality and safety is assured. Driverless vehicles are coming, and they are coming fast. But again, what about trucks specifically? Any realistic time horizon for self-driving trucks needs to look at horizons for cars and shift those even further towards the present. Trucks only need to be self-driven on highways. They do not need warehouse-to-store autonomy to be disruptive. City-to-city is sufficient. At the same time, trucks are almost entirely corporate driven. There are market forces above and beyond private cars operating for trucks. If there are savings to be found in eliminating truckers from drivers seats, which there are, these savings will be sought. It's actually really easy to find these savings right now. Wirelessly linked truck platoons are as simple as having a human driver drive a truck, with multiple trucks without drivers following closely behind. This not only saves on gas money (7 percent for only two trucks together), but can immediately eliminate half of all truckers if for example 2-truck convoys became the norm. There's no real technical obstacles to this option. It's a very simple use of present technology. The answer to the big question of "When?" for self-driving trucks is that they can essentially hit our economy at any time. Main Street USA has already taken a big hit, and increasingly so, over the past few decades. Manufacturing has been shipped overseas to areas where labor is far cheaper because costs of living are far cheaper. Companies like Walmart have spread everywhere, concentrating a reduced labor force into one-stop shopping facilities requiring fewer total workers than what was needed with smaller, more numerous, and more widely spread Mom & Pop type stores. Companies like Amazon have even further concentrated this even further reduced labor force into automated warehouse centers capable of obviating stores entirely and shipping directly to consumers. All of the above means fewer ways of securing employment in fewer places, while commerce has become more geographically concentrated and access to money has become increasingly shifted away from the bottom and middle of the income spectrum towards the top. This is what happens when good-paying jobs are eliminated, and that money not spent on wages and salaries instead stays in the hands of owners of capital, or is given in smaller amounts to lower-paid employees in lower-wage jobs. 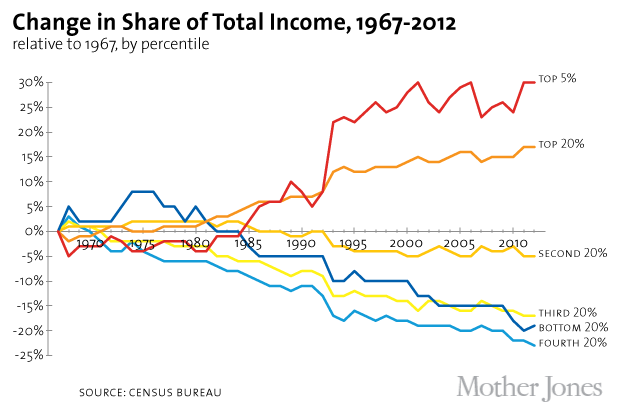 Inequality grows more and more extreme and our land of opportunity vanishes. Economic growth slows to a crawl. This is where we're at and this is what we face as we look towards a quickly approaching horizon of over 3 million unemployed truckers and millions more unemployed service industry workers in small towns all over the country dependent on truckers as consumers of their services. The removal of truckers from freeways will have an effect on today's towns similar to the effects the freeways themselves had on towns decades ago that had sprung up around bypassed stretches of early highways. When the construction of the interstate highway system replaced Route 66, things changed as drivers drove right on past these once thriving towns. The result was ghost towns like Glenrio, Texas. With the patience that carved the Grand Canyon over eons, nature reclaims Glenrio, where the clock stopped with the bypass of Route 66. The replacement of Route 66 with a four-lane superhighway that allowed motorists to zip past rather than wander through ultimately allowed Glenrio to decline. With self-driving cars and trucks, here again we face the prospect of town after town being zipped past by people (if even present) choosing to instead just sleep in their computer-driven vehicles. Except this time, there is no new highway being made for businesses to relocate closer to and new towns to emerge along. This time, as is true of the effect of technology on jobs, it's different. This time, there's no need for entire towns to even exist at all. As close as 2025 -- that is in a mere 10 years -- our advancing state of technology will begin disrupting our economy in ways we can't even yet imagine. Human labor is increasingly unnecessary and even economically unviable compared to machine labor. And yet we still insist on money to pay for what our machines are making for us. As long as this remains true, we must begin providing ourselves the money required to purchase what the machines are producing. Without a technological dividend, the engine that is our economy will seize, or we will fight against technological progress itself in the same way some once destroyed their machine replacements. Without non-work income, we will actually fight to keep from being replaced by the technology we built to replace us. Just as our roads a decade from now will be full of machine drivers instead of human drivers, a 21st century economy shall be driven by human consumers, not human workers, and these consumers must be freely given their purchasing power. 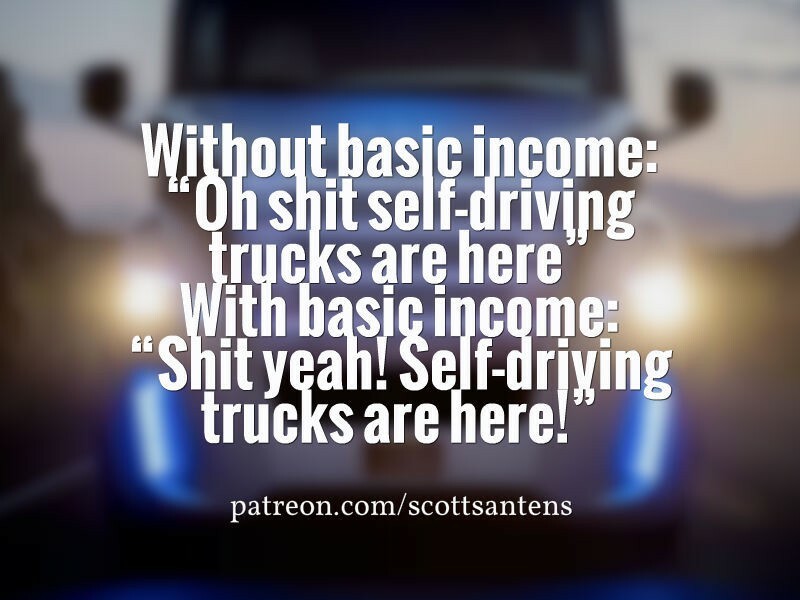 If we refuse, if we don't provide ourselves a universal and unconditional basic income soon, the future is going to hit us like a truck -- a truck driven solely by ourselves. To allow this to happen would be truly foolish, for what is the entire purpose of technology but to free us to pursue all we wish to pursue? Fearing the loss of jobs shouldn't be a fear at all. It should be welcomed. It should be freeing. No one should be asking what we're going to do if computers take our jobs. We should all be asking what we get to do once freed from them. Scott Santens writes about basic income on his blog. You can also follow him here on Medium, on Twitter, on Facebook, or on Reddit where he is a moderator for the /r/BasicIncome community of over 26,000 subscribers.